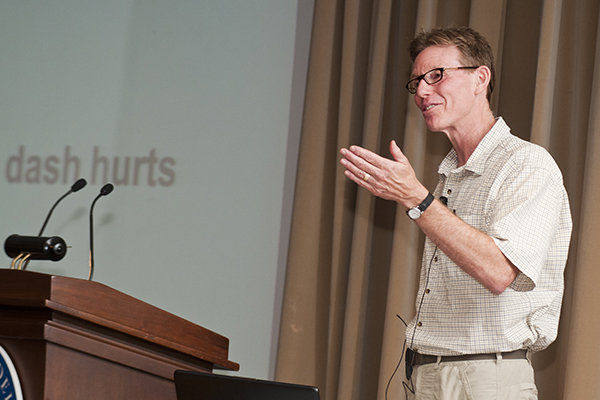 Ed McCleskey, scientific officer with the Howard Hughes Medical Institute, delivered the keynote address at the Undergraduate Research and Service Celebratory Symposium. Student presenters Lisa Pilchman (left) and Michael Rowley (center). 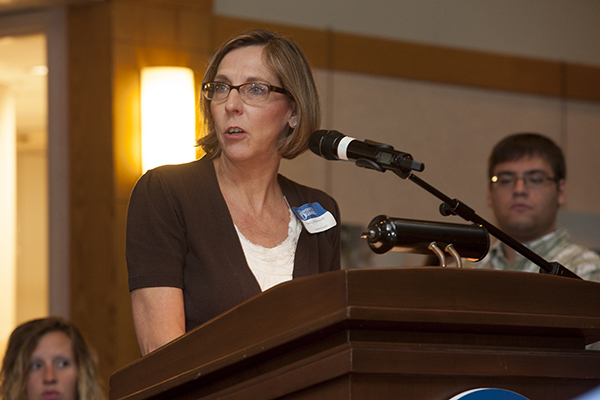 Lynnette Overby, director of UD's Office of Undergraduate Research and Experiential Learning, addresses the symposium. 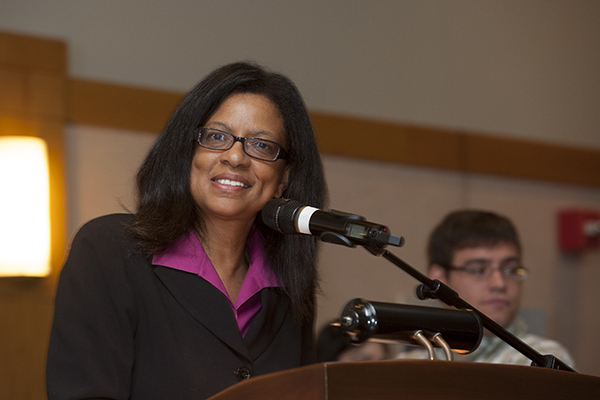 Nancy Brickhouse, interim provost, welcomes students and faculty to the symposium. Hal White, director of the Howard Hughes Medical Institute Undergraduate Science Program at UD, introduces HHMI's Ed McCleskey. 2:44 p.m., Aug. 14, 2012--The University of Delaware hosted the third annual Undergraduate Research and Service Celebratory Symposium on Thursday, Aug. 9, in Clayton Hall. 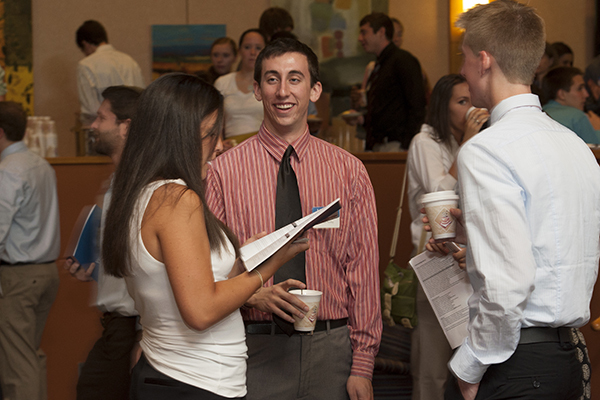 The capstone event showcased the accomplishments of more than 330 undergraduate students who participated in summer research and service projects with faculty advisers and community partners. Following a welcome from Nancy Brickhouse, UD interim provost, the symposium featured oral presentations and student poster displays. Ed McCleskey, scientific officer with the Howard Hughes Medical Institute, gave the keynote address. 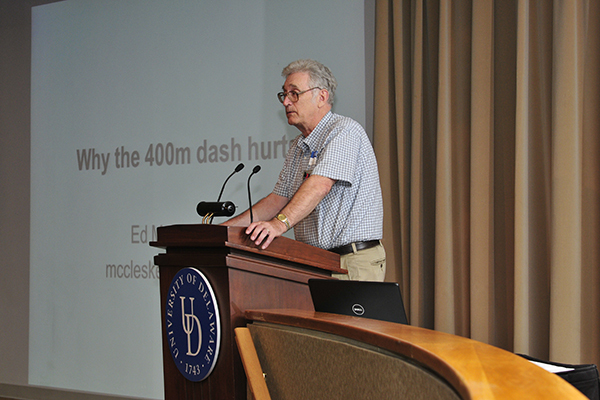 In welcoming McCleskey, Harold (Hal) White, director of the Howard Hughes Medical Institute Undergraduate Science Education Program at UD, said the symposium affirms the University’s continuing commitment to undergraduate student research. McCleskey noted how graduate school helped him to develop a valuable set of skills that incudes mastery of method, verbal and written communication, complex data analysis, strategic thinking and self-motivation. McCleskey said that careers for graduates with a doctorate in science include academic and corporate research scientist, undergraduate college professor, patent law, science writing, administrative finance and government advising. Katia Sol-Church, director of the Biomolecular Core Laboratory at the hospital, was faculty adviser. Pilchman said working in the laboratory convinced her that she still loves the field of genetics and is considering a career in genetic counseling. Faculty adviser for the project was James Richards, Distinguished Professor of Kinesiology and Applied Physiology. Although the results differed from his hypothesis, Rowley said they also extended the scope of his original research interests to include the possible role of the knee and the hip in determining the landing impact. Rowley plans to go to graduate school to earn a doctorate in biomechanics and kinesiology and pursue a career in academic research and teaching. Jennifer Ferris, a senior history education major and Honors Program student, worked on the Social Studies and the Stage project at the Kuumba Academy in Wilmington. Lynnette Overby was faculty adviser. Sophie Bandlow, a junior elementary education major, worked under the direction of Eugene Matsuov, professor in the School of Education, to create a math-focused Play and Learn program at the H. Fletcher Brown Boys and Girls Club in Wilmington. Brittany Drazich, a senior nursing major and Honors Program student, Paula Kalksma, a senior health behavior science major, and Whitney Harris, a health behavior science major, worked at the Howard Weston Senior Center in New Castle, using the Wii and Kinect game consoles for a summer-long ExerGame Olympics. Faculty adviser was Elizabeth Orsega-Smith, associate professor of behavioral health and nutrition. Roberta Golinkoff, H. Rodney Sharp Professor in the School of Education, and professor of linguistics, cognitive science and psychology, said one of the things that makes UD so special is its attention to undergraduate researchers. First place: Taylor Smith, a senior environmental engineering major, “Biochemical Processes Utilizing Electrogenic Bacteria.” Faculty mentor, Steven Dentel, professor of civil and environmental engineering. Second place: Peter Attia, a senior chemical engineering major, “Thermoelectric Poser Generation in a Tempororally-Varrying Temperature Environment.” Faculty mentor, Joshua Zide, assistant professor of materials science and mechanical engineering. Also, Justin Teesdale, a senior chemistry major, “Rhenium Platforms Supporting Ancillary BODIPY Chromophores for Conversion of CO2 to Fuels.” Faculty mentor, Joel Rosenthal, assistant professor of chemistry and biochemistry. Third place: Annie Sanger, a junior biomedical engineering major, “Recycling of Bio-Rad SDS gel Cassettes.” Faculty mentor, Catherine Grimes, assistant professor of chemistry and biochemistry. The award was established by the UD Undergraduate Research Program, the University of Delaware Library and Gale, a leading organization in e-research and educational publishing, to encourage undergraduate research and projects in the area of sustainability. The prize is presented in conjunction with the implementation of the Global Reference on the Environment, Energy and Natural Resources (GREENR) database by the library. The symposium is planned and implemented by the Alliance of Summer Scholars Programs, a group of directors and coordinators of more than a dozen summer experiential programs at UD.